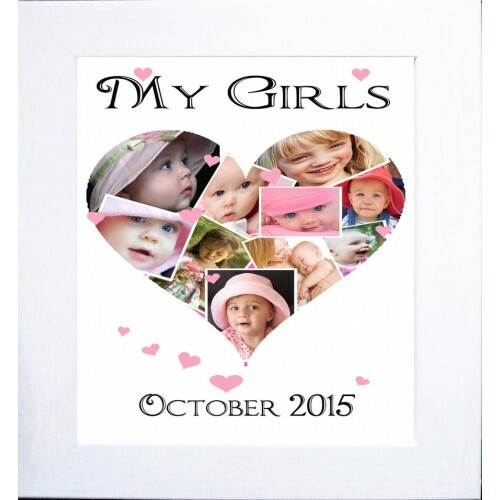 Heart Personalised Photo Collage Print – A gorgeous personalised heart photo collage keepsake using your photos and our knowledge, this item can be personalised to suit your photos, simply upload your photos (the number of photos can be adjusted, so you can add approx. 10-25 photos if you wish, or less if you prefer, we will adjust the artwork to suit your photos, this keepsake is especially designed for you and we will create your beautiful, personalised Photo frame keepsake, especially for you by adding your photos into the artwork, giving you a lovely personalised heart keepsake that is totally unique to you, each piece is a unique piece of artwork and this makes a perfect gift or keepsake and a unique way to capture your photos in an interesting way. This is a really stunning personalised photo collage keepsake in the shape of a heart, we create this for you using your photos, so it is totally unique to you and it makes an ideal gift for any home or occasion, this is an easy way of creating a really beautiful and striking, professionally hand-finished, personalised photo collage framed keepsake for you, when you purchase this item, simply email us your photos and then we will set about creating your beautiful, personalised heart photo collage print, a luxury unique keepsake, made especially for you. These gorgeous, personalised, photo frame keepsakes come framed in a luxury, real wooden frame, this is available in a choice of natural, black or white wood finishes, the frame will be varnished, painted and waxed to a high standard and you can choose to have your finished keepsake framed in an A5, an A4 or an A3 size, giving you a fantastic choice of finishes to get the exact finish that you want, each piece is a genuine work of art with a real luxury finish for a top quality product. Each piece is created and printed especially for you, so this personalised, photo keepsake is normally completed within 5 days of receiving your approval of the proof, we are normally much faster than this though. We will adjust your photo to ensure that we give you the best results, we can create your keepsake from colour, black and white or sepia photos, just please ensure that you send us clear photos to work with, we may need to add background detail to fit your photo in the space for this particular keepsake, our keepsake artists are extremely skilled at doing this to ensure the best results for you. All finished on quality card with high quality inks to minimise any fading of your photos, this is a truly gorgeous personal keepsake, we will also add tiny diamonte or glitter decorations & stars to your finished artwork to give it that really special finish, please note that every frame is finished by hand so each will vary slightly, we work to give you the best finished product every time.. The frames are quality pine wood and the size refers to the glass size, please note that we use real glass in our frames not Perspex, this is to ensure that your product lasts a lifetime, Perspex fronted frames scratch very easily & therefore spoil, glass gives you a longer lasting keepsake and ensures a clearer vision of your personalised photo keepsake, giving you a better quality product, with a long lasting finish. Please note that this piece woks best in the A3 size for the individual photos to be seen clearly, the smaller sizes will make the photos quite small, this still looks great but of course you have to look more closely to see the individual detail. This price is inclusive of FREE UK MAINLAND postage, for all other areas we offer a small subsidised posting charge. Photos should be clear and straight on of the desired person/object, we may be able to remove the background to enhance your photo, but this is not always possible to do and so you should ensure that the photos are good quality and clear for us to print, a blurry photo does not make for a great keepsake, please do not crop your photos, it is better to leave us to do that for you, this way we can be sure of creating the best possible piece for you. Please check that you include any capital letters that you want included for the names etc. we will print as you request it, we will copy and paste your text exactly as you instruct us to. Please add any further information you think we might need to create your item for you, ie name changes or different layout requests. A Keepsake Creation – Personalised Photo Frame for a family, simply upload your photo and we will cr..
A Keepsake Creation – Upload your photo and we will create your beautiful Photo frame keepsake, espe..
A Keepsake Creation – Upload your photo and we will create your beautiful, personalised Photo frame ..
A Keepsake Creation – We turn your photo into a beautiful, personalised photo keepsake, simply uploa..
A Keepsake Creation – Personalised Framed print for a family capturing your most precious moments, s..